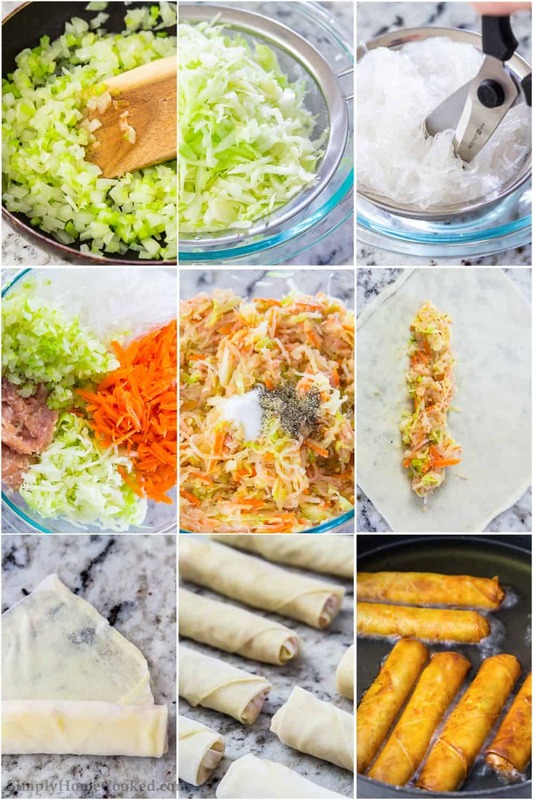 If you love crispy, crunchy, and easy to make spring rolls, then this fried spring roll recipe is right up your alley. And the best part…they’re freezer friendly! When making an Asian themed dinner, these spring rolls, shrimp tempura sushi roll, shrimp tempura, and Asian chicken salad are always on the menu for appetizers. In two separate heatproof bowls, submerge the shredded cabbage and bean threads in boiling water for about 5 minutes and drain the water out. Then cut through the bean threads about 30-40 times using kitchen shears or scissors. Now combine the ground chicken, shredded cabbage, bean threads, shredded carrot, sauteed vegetables, salt, and pepper. Fill the spring roll wrappers with the chicken filling, bush the edges tightly and roll them up tightly. 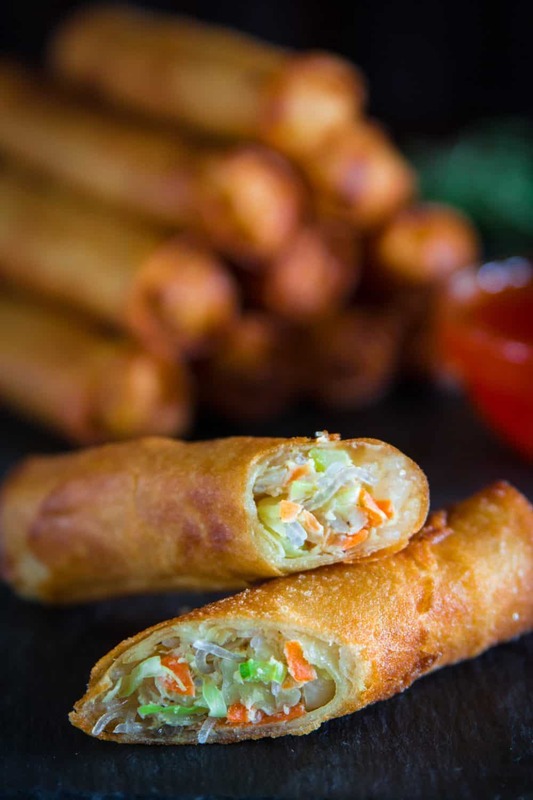 Now fry each spring roll in a heavy bottomed skillet filled with canola oil over high heat. What are fried spring rolls? Fried spring rolls are made with a thin paper-like wrap (not rice wrap) and are usually filled with a combination of meat and vegetables. They are then deep-fried or pan-fried. They also sometimes referred to as lumpia. You can find spring roll wraps at most Asian food markets. Egg rolls are also filled with meat and vegetables but are wrapped in a thicker dough-like wrap. Egg rolls can either be baked or fried. What are fresh spring rolls? Fresh spring rolls are cold Vietnamese rolls (obviously not cooked). They are made with rice paper wraps and are typically filled with cooked prawns, lettuce, carrot, Thai basil, mint, and cilantro. They are commonly dipped in peanut sauce. Can I bake spring rolls? If you prefer not to fry spring rolls, you can bake them instead. Place them on a baking sheet and spray them with non-stick spray. Bake at 435 degrees Fahrenheit for 30 minutes, turning them halfway through baking. Can I freeze spring rolls? Yes, you can freeze spring rolls. Roll them up and place the uncooked spring rolls in a single layer on a baking sheet. Freeze until solid (about 4 hours) then place them into a ziplock bag and freeze for up to 3 months. Place the frozen (uncooked) spring rolls into a heavy bottomed pot filled with about 2 inches of hot canola oil and cook over high heat until golden brown. These fried spring rolls are the ultimate Asian appetizer. They are sure to impress even the pickiest eaters. Heat 2 tbsp oil in a small pan and sauté the chopped onion until translucent. Add the chopped celery to the onion and sauté for another 2-3 minutes. Place the bean threads in a heatproof bowl and submerge them in boiling water for about 4-5 minutes. Drain the water out using a mesh strainer and roughly cut through the noodles with kitchen shears. Finely chop the cabbage and submerge it in hot water for 5 minutes as well. Strain the cabbage of all water and set it aside to cool. In a large bowl, combine bean threads, cabbage, shredded carrot, ground chicken thighs, and the sautéed onion and celery. Season with salt and pepper. As mentioned in the ingredient list, use less salt if you plan to dip the rolls in soy sauce. Begin assembling your spring rolls by laying out one spring roll wrap with a corner pointed toward you. Spread about 2 tbsp of the chicken and cabbage mixture in the middle and fold the bottom corner up over the mixture. Fold the left and right corners toward the center and continue to roll. Brush a little water on the top corner to help seal the spring roll. Fill a skillet with about 2 inches of canola oil. Bring the oil to medium high heat and fry each spring roll 2-3 minutes per side. Place the fried spring rolls on a plate lined with paper towels to absorb excess oil. Serve hot with soy sauce or sweet chili sauce. This recipe was originally published on Mar 22, 2017, it has been updated since. I’ve never tried fried spring rolls as we always make them fresh. But I bet these are so good. They remind me a lot of egg rolls that we make with cabbage filling. Thank you Kat, the fresh type of spring rolls are definitely lighter and healthier, but there is something about that irresistible crunchiness of fried spring rolls! So good! Thank you for such detail directions on how to fry spring rolls. I’ve only baked mine in the past but would like to try the real deal! Nothing bits crispy exterior! I hope you love this fried spring rolls recipe Julia! That crispy exterior is everything! I am curious if an airfryer would give similar crispiness. Definitely should try that. I am excited to make those crispy spring egg rolls. I wonder how they would turn out in airfryer, definitely would test it. Oh, NatD that sounds like a genius idea! I would love to know how the spring rolls turn out in an airfryer! Thanks for sharing your recipe. If you freeze the uncooked rolls as you have suggested, do you thaw them before frying? Or place them in the hot oil from frozen? Hi Wendy, I’ve never tried them in an air fryer so I can’t say much about how they will turn out. Can you tell me are the spring roll wraps gluten-free and if so do you know where in the New York area I can get them? Hi Helen unfortunately, I don’t think they are gluten-free. They can be found at almost any Asian food market. I believe H Mart should have them. Can you freeze these after they are made…before you cook them? Hey Patty, yes you can freeze them. 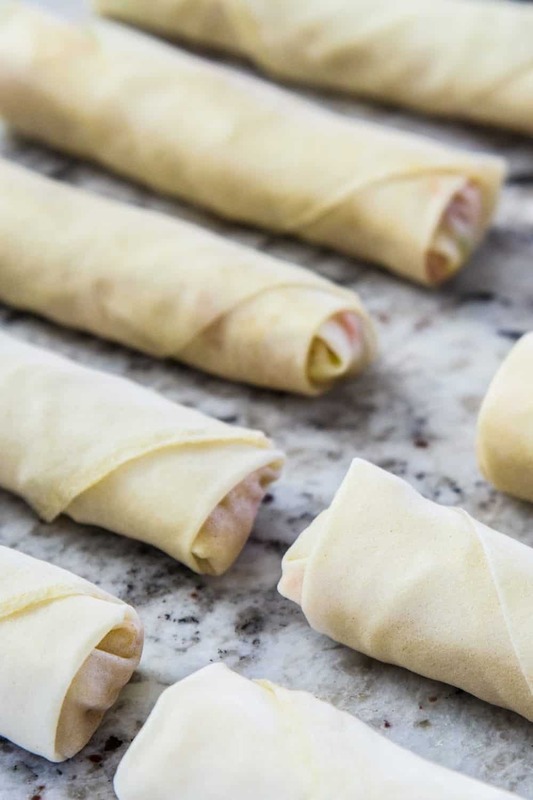 Lay the uncooked rolled up spring rolls flat on a baking sheet lined with parchment paper and freeze for 2-3 hours. Then place them in an airtight container or ziplock bag. Freeze for up to 6 months. Super excited about these – durring my pregnancy, I’d wake up at tthree in the morning craving spring rolls! Should the chicken be pre-cooked in any way? Thanks! Hi Allie, I’m glad you’re looking forward to this recipe 🙂 nope no cooking the chicken. It gets cooked when you fry them. Hi Daphne, bean threads are a type of cellophane noodle that are transparent and made from starch and water. If you don’t have a local Asian market that sells these noodles, you can use rice noodles instead. Most grocery stores should have rice noodles (in dry form). I’ve been looking for a good lumpia recipe..I’m super excited to try this! I have a Filipino friend and I’m still waiting on the promised lumpia cooking session from her!!! Lol I’ll give them a try this week, thank you for sharing!